That was a simple little statement in my last article for the Woman’s Journal. The understanding of that statement is the key to the door that opens into the room where trust is created. 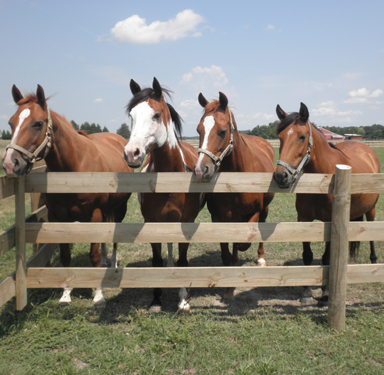 Trust is fundamental to the exceptional relationship between horse and rider. For good or bad, that relationship will be the most important aspect of your life while you are sitting upon the beast. 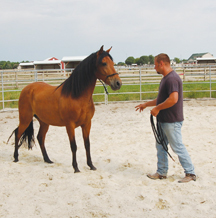 communicate clearly with your horse. This will then facilitate soft and supple transitions in speed and/or direction easily without adding to the native tension, which the removal of native tension is one of the goals of training. Simply put, harmony is the silence between the notes. Without that silence, there is no music, just noise. Since the language used with the horse is body language, silence is achieved through non-interference of locomotion of the horse. especially the movement of the pelvic region in the human while riding. That pelvic practice is usually best achieved through bare back riding while being longed on a calm quiet horse. No leg or rein aids are to be used during this exercise. Those aids or their suitable replacements are to be handled by the person longeing you. and then which in turn allows the rider’s pelvis to be moved properly without interfering with the horse. Your job as a rider is to realize the affect of the horse’s motion on you and to maintain proper position while absorbing the motion. The golden rule for these exercises is as follows Breathe! Inhale. Sit taller. Exhale. Relax. Continuous breathing, in and out, long deep breathes. Sit taller every inhale and become more relaxed every exhale. Remember to control your breathing and you will control your mind and control your body. You should notice a slight difference in the motion from the left compared to the right, this is perfectly normal. The difference is normal in your ability to absorb motion from left to right, once both directions are mastered progress to the trot. Again, when balance and relaxation are achieved in both directions, progress into the canter. Warning, it is often the transitions between gaits that are the hardest to master. 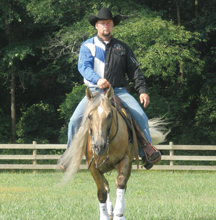 Using a well-gaited horse with nice transitions will be very conducive to your goal. Body control results in clear communication. My name is Colleen Swain and I am 47 years old and a retired police officer from N.Y. I have ridden horses my entire life and thought I was a pretty proficient rider and had reasonable horse knowledge. Three years ago for my Christmas present I received a 19 month old gelding. I started searching for the right trainer and after six to ten recommendations I called Dean Roles. After a two hour conversation I chose Dean as my trainer. My gelding is now 5 years old and in my opinion, the best trained horse in my pasture. His ground manners are impeccable. 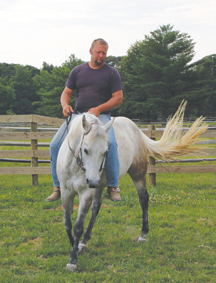 Dean Roles’ special method of training you and your horse is remarkable. The more I learned the more I wanted to learn. 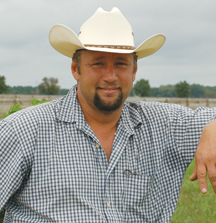 I honestly developed an addiction to gaining knowledge from Dean and my horse was truly happy at his farm. I am the mother of two daughters and I would say the satisfaction I got when I found Dean was the satisfaction you get when you find the perfect babysitter. 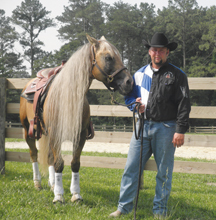 With Dean your horse will reach its full potential. Next Story → Asea – Live Younger Longer!